The series of escalators in the steep Mid-Levels district of northwest Hong Kong Island is designed for commuters, but most appreciated by sightseers who can rest their legs and enjoy the fascinating sights. Take a stately (and free) ascent past busy street scenes, traditional shops and apartment windows. .
Hong Kong’s trams date back to 1904, making this one of the oldest continuously used tram systems in existence. They are still one of the best ways of exploring the Hong Kong Island shoreline. 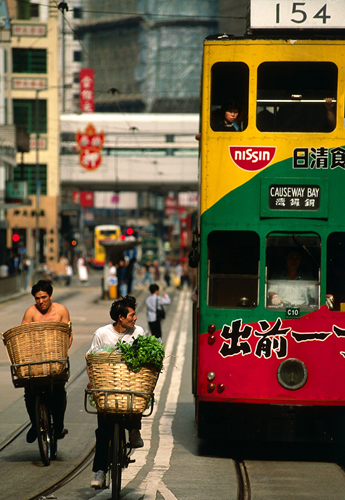 Trainspotter’s trivia: it’s also the only double-decker tram system in the whole world. Since 1888, this funicular railway has made the jaw-dropping ascent of Victoria Peak, and remains a must for visitors. Under the unwritten rules of colonial times, certain seats were reserved for high officials; now, seating is an amiable free-for-all. .
Should your attention span wane on the fleeting 24-minute ride from the airport to Central, the AEL offers personal TVs in the back of every seat. Bright, shiny and a joy to use. Hong Kong’s underground railway is a world leader, handling three million people a day with rapid and robotic efficiency. Signs are in both English and Chinese, delays are almost unheard of, and with fares starting from the price of a cup of coffee, a trip around the city is surprisingly affordable, too. The fabulous Star Ferry connects Hong Kong Island to Kowloon. Pay half the price of a cup of coffee for a first-class view of one of the world’s most remarkable harbours and skylines. 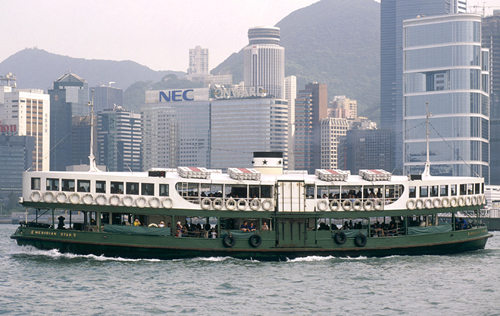 Other ferries connect Hong Kong to the outlying islands and parts of the New Territories . 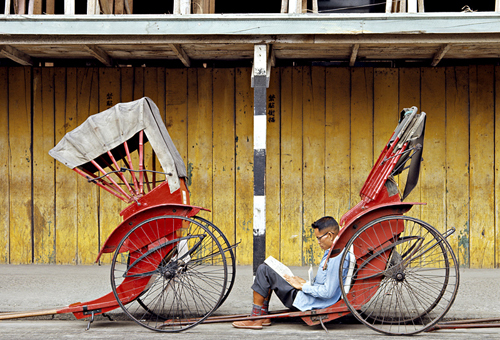 There are just seven rickshaws left in all Hong Kong, their elderly drivers earning a living by charging tourists for photos. Don’t ask for a ride, unless you want richly-deserved abuse from passers-by: these old guys can’t make their way halfway down the road without collapsing in an exhausted heap. Hong Kong cabbies are as psychotic as big city cabbies everywhere. Their rudeness is legendary, but you probably would be too if you had to deal with Hong Kong traffic all day, every day. Fortunately, tighter policing means that overcharging is now a rare occurrence. On a per capita basis, Hong Kong probably has more Mercedes and Rolls Royces than anywhere else in the world. Some 15 of the latter are owned by the Peninsula Hotel alone – including a Phantom II dating from 1934. 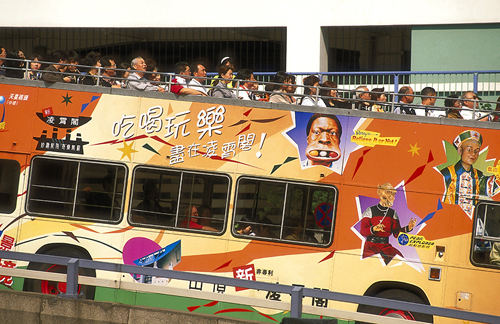 Hong Kong’s double-decker buses are a British legacy, although these mostly come air-conditioned and (in a universally loathed development) with onboard TVs blaring ceaseless advertising. The low cost of using them may help you overcome this irritant. 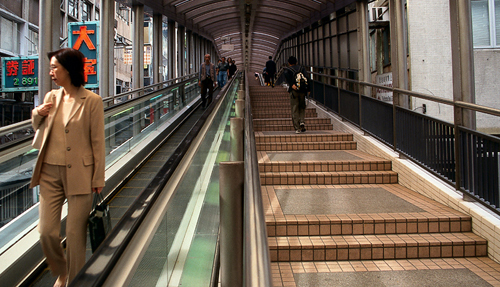 The world’s longest covered escalator system is a sight unto itself. Some 211,000 people ride the system daily, bypassing the Mid-Levels’ notorious traffic snarls. The escalator begins opposite this agreeably raucous fruit and vegetable market. (“Below Hollywood Road”) The start of the journey takes you through the heart of this hip quarter. (“South of Hollywood Road”). Alight at the first stop and walk a block uphill for trendy bars and eateries. Home to antique shops, galleries, nightclubs, bars and the historic Man Mo Temple. Several en route, many specializing in the bright new wave of Chinese art. So named because a 19th- century signwriter wrote “Alexander” from right to left, in the Chinese manner. Uncorrected to this day. Also known as the Shelly Street Mosque, built in 1915. One of three mosques catering to 70,000 Muslims. Where SoHo peters out, and the Mid-Levels begins amid forests of upscale apartment blocks.